The environmental quality of agricultural landscapes can be improved by investing in green infrastructure(1) , which will, among other goals, improve biodiversity conservation. However, to ensure these initiatives are successful, stakeholders must be engaged in their design and delivery. 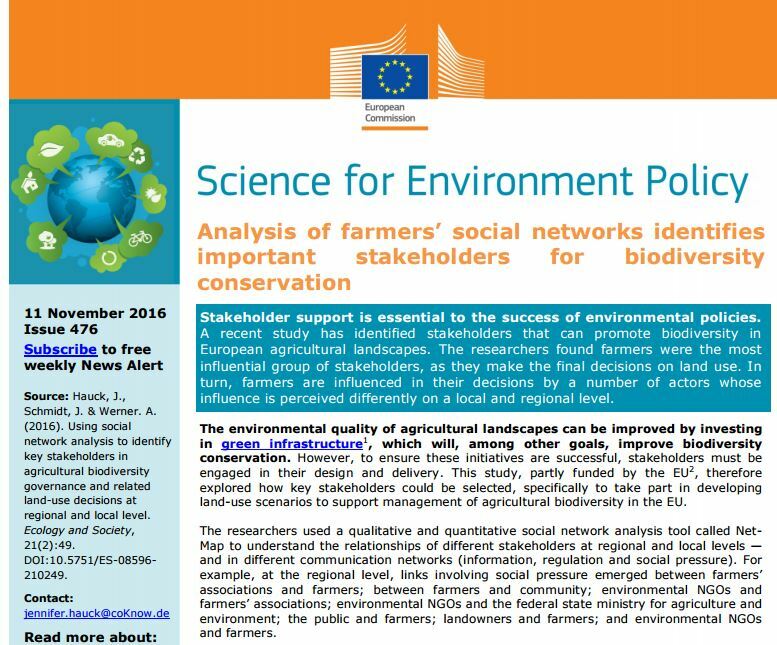 This study, partly funded by the EU2, therefore explored how key stakeholders could be selected, specifically to take part in developing land-use scenarios to support management of agricultural biodiversity in the EU. Authors: Hauck, J., Schmidt, J. & Werner. A. (2016). Using social network analysis to identify key stakeholders in agricultural biodiversity governance and related land-use decisions at regional and local level. Ecology and Society, 21(2):49.